On November 23 police enforced an Ontario Superior Court order to Occupy Toronto to vacate St. James Park, a few blocks from Canada’s corporate financial hub. Occupy camps around the world, from Oakland, California, to London, England, from New York to Vancouver, are also under seige. Whether re-locating, or clinging to home turf, the physical encampments inspired a mass movement against social inequality and injustice. They put proponents of the dysfunctional capitalist system on the defensive. Whatever happens next, the challenge is clear: Spread this movement from the parks and city squares to the sites of social production, distribution and exchange. “I’ve been asked to describe how the work of Socialist Action relates to the Occupy movement, and how we can grow and develop our work together. “The first order of business is: congratulations! Congratulations to everyone who initiated the Occupy movement. From Tahrir Square in Cairo, to our sisters and brothers in Athens, and in Wisconsin. From Wall Street to London to Madrid to Toronto. What began with the Arab Spring, and spread like wild fire to over 1400 cities worldwide, cannot be extinguished. It is the voice of the voiceless. It is the cry of unemployed youth. It is the cry of dispossessed aboriginal peoples. It is a beacon of hope for the victims of ethnic cleansing, women’s oppression, class exploitation and environmental plunder. No matter what the clowns at City Hall may do, Occupation is here to stay. Dismantle it in one place, and it will sprout again, like a sea of dandelions. 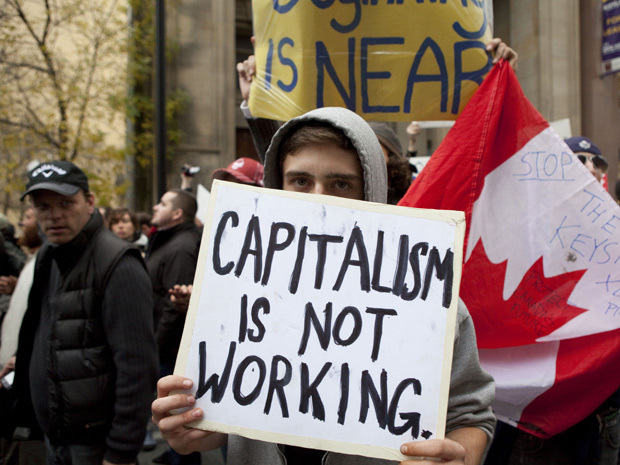 “That’s because Occupy expresses a seismic shift. It is the shift from ignorance and complacency, to awareness and action. It points not only to gross economic inequality and injustice. It points not only to the greed and malfeasance of the ruling 1 per cent. It points to the need to rid this planet of capitalism — the toxic system responsible for the social ills that ail humanity. “Socialist Action is proud to have been part of this movement from the beginning. Our comrades in the U.S., in New York, in Hartford, Conn., in Boston, in Philadelphia, in Chicago, in Minneapolis, in Phoenix, in Oakland, and many other cities are participants and advocates. Have a look at our newspaper, Socialist Action, and see how we work to win support in the labour movement, and to defend Occupy against police repression. “That’s what we must do here: Defend the Occupy movement. Defend it from bozo politicians, from police repression, from the commercial media which inflates the complaints of a few petty bourgeois restaurateurs into a social calamity — the only apparent solution for which is the suppression of freedom of speech and freedom of assembly. We say: Hands off Occupy Toronto. It is the best thing that’s happened to this park and to this city in a long time. “That brings us to a bigger challenge: how to extend the Occupy movement to the factories and offices, to the mines and mills, to the stores and schools, to work places and to communities across this city and across this country. We can draw a lesson from Quebec where, this past week, over 200,000 students shut down schools and occupied the streets to oppose tuition increases and to demand free, quality, public post-secondary education. We can take encouragement from the Orange Wave (NDP surge) last Spring that marginalized the discredited Liberal Party in its wake. We are inspired by environmental activists whose actions forced US President Obama to delay construction of the Keystone XE pipeline. “These events underline a compelling truth: Occupy is a powerful symbol, a resilient rallying point. It has changed the channel. It has ignited a conversation of millions. But to win, to truly win human liberation and save civilization from the ravages of the profit system, we need to shut capitalism down. We need to re-boot production on a green, democratic basis, and build a cooperative commonwealth. “That’s what we in SA mean by socialism, a democratic cooperative commonwealth, where production is wholly owned and controlled by working people, where the military is reduced to a rescue and disaster relief corps, where the 1% are expropriated, and where the state is transformed into the servant of the 99%. That’s what socialism will look like. “What stands in our way? If it was just the 1 per cent, it would be easy, and it would have been done long ago. Standing in the way of economic democracy is a gigantic apparatus of minority rule. The cops, the courts, the bought-and-paid-for media, religious institutions, the managerial elite, and the capitalist political parties. How can we clear a path to majority rule? The same way we defend and spread the Occupy movement. We tell the truth, we build alliances, and we fight the forces that stand in the way of liberation. “Before the workers’ and popular movements can go forward, we need to remove the obstacles within. I refer to the labour, NGO and NDP bureaucracies. Donations of food, tents and port-a-potties are good. But they are no substitute for organized resistence to labour concessions in the work place. They are no substitute for a battle over the lack of democracy in many unions and the NDP. Rather than walk away from the problem, we need to dig in and fight for socialist policies and democracy from the bottom up. “That’s what Socialist Action does. We build support for Occupy Toronto, and we organize a fighting opposition to labour mis-leaders who go along with cutbacks, with privatization, with layoffs in the public service (such as advocated by the Drummond commission at Queen’s Park). We argue for a General Strike to stop the cuts. We oppose government contracts to build jet fighters and war ships, to construct pipelines for dirty oil, and to invest in nuclear energy. We demand a steeply progressive tax on big wealth, on inheritance, and on corporate profits – not just an end to recent corporate tax cuts, not just abolition of the HST, not just a Robin Hood tax, or a Tobin Tax. We demand public ownership of the commanding heights of the economy under workers’ and community control. “We don’t think that we, or any individual or small group can accomplish this alone. For that reason Socialist Action devotes most of our efforts to building coalitions, alliances, broad unity in action. That is why we play a leading role in the NDP Socialist Caucus, a broad alliance of anti-capitalist party members who seek to win the 4.5 million NDP voters to a Workers’ Agenda. That is why SA plays a leading role in the Workers’ Solidarity and Union Democracy Coalition, which is now fighting layoffs, and opposing OPSEU leaders’ threat to quit the Ontario Federation of Labour. That is why SA initiated the October 15 Coalition of 11 organizations that marked the 10th anniversary of the imperialist war and occupation of Afghanistan with a rally and march that concluded right here, in St. James Park. That is why we sponsor educational conferences, concerts to raise money for workers on strike, an annual May Day celebration, and Rebel Films, which attracted close to 500 people to the latest Rebel Film series at OISE. “We don’t have all the answers. But we do know this: To win in the face of corporate state power requires a revolutionary perspective. It requires a conscious mass base in the working class. The revolutionary battle for hearts and minds takes place in the existing mass working class organizations. That is where we are fighting to build solidarity, to build the Occupy movement, to spread it to unions, to the NDP, to work places and communities, and to put an end to the cancer of capitalist minority rule. > The article above was written by Barry Weisleder.